Summer is finally here, and one could safely assume that you are searching for alternatives to cool during this hot season. If you live in a small apartment and you do not have very much space to spare, you might think that you have no other option than to soldier through the scorching heat by using a fan. However, there is no need to take the fan out of the attic and stock up on napkins. Instead of resorting to improvised methods of cooling, you might want to consider purchasing a low-profile air conditioner. A device of this type will not only cool your small space in a timely fashion but will also help you save up on energy bills. Since there are so many products on the market, we have gathered a small list of affordable units to make your decision easier. For the purposes of this article, we have picked a handful of units with good price-quality ratios. If you want to see other low-profile air conditioner models, you could read more reviews on Best10Anything. Without further ado, here are five affordable low-profile air conditioners. This first model of low-profile air conditioner is perfect if you are looking for something small, efficient and without any fancy features. This 12,000 BTU model can cool off a room measuring up to 550 square feet. It has all the basic features that every low-profile air conditioner should have, such as a filter alert, an energy saver mode, a 24-hour timer, and a remote control. On top of all that, it is very easy to install and set up without professional assistance, so you will not have to spend money on a technician. Its only downside is that it might be a little too noisy for some people’s liking, but you will get over it as soon as you see how much money you will save up. While the Friedrich Chill might fall short when it comes to BTU, it more than makes up for this small drawback by being one of the most energy efficient low-profile air conditioners on the market. This mid-sized unit has two features that support energy efficiency, namely, the fan spinning only in the midst of cooling, and the fact that it includes a 24-hour timer that allows users to program on/off times. If you suffer a power loss, the machine will resume its activity with previous settings, so you do not have to set it up every time this happens. On top of that, it makes very little noise, which makes it very suitable for families with small children, or people who live in apartment blocks with thin walls. What the Keystone lacks in BTU, it compensates through great coverage and intuitive control schemes. The well-designed remote control features a ‘’Follow me’’ function, which means you can control and set up the air conditioner from anywhere within a room, as long as it does not measure more than 450 square feet. The unit comes with a high-quality LED display that allows for easy settings management, as well as a mesh filter that is very easy to clean and maintain. Adding to the list of useful functions are the auto-restart function, energy-saver mode and an alert that warns users in case there is something wrong with the filter. This LG model is perfect for people who want something simple, efficient and easy to control and install. While the coverage could be better (340 square feet), it is small enough to fit in a medium-sized room without occupying too much physical space. According to the user manual, it has a 12.1 energy efficiency ratio, with a dehumidification capability of up to 2.2 pints per hour, facts which make this unit very suitable to places with humid tropical climates. Therefore, if you are looking for something efficient that does its job well, then this low-profile air conditioner from LG might be right up your alley. This Haier unit comes with four different modes that will help you save a lot of money in energy bills: energy saver, dehumidify, fan and cool. One of the best perks of this model is the fact that, thanks to its compact size, it can be mounted on pretty much any window without occupying too much space and ruining the aspect of the room. But, like always, there is a catch: with a BTU just slightly above 6,000, this low-profile air conditioner can cool rooms measuring between 150 and 250 square feet. On the other hand, it is one of the most silent air conditioner units on the market (43 dBA) thanks to its compressor blanket. As for the other features, it has a sleep mode, an auto cool function, and a 24 hour on/off timer. This was our selection of the five most affordable low-profile air conditioners on the market. 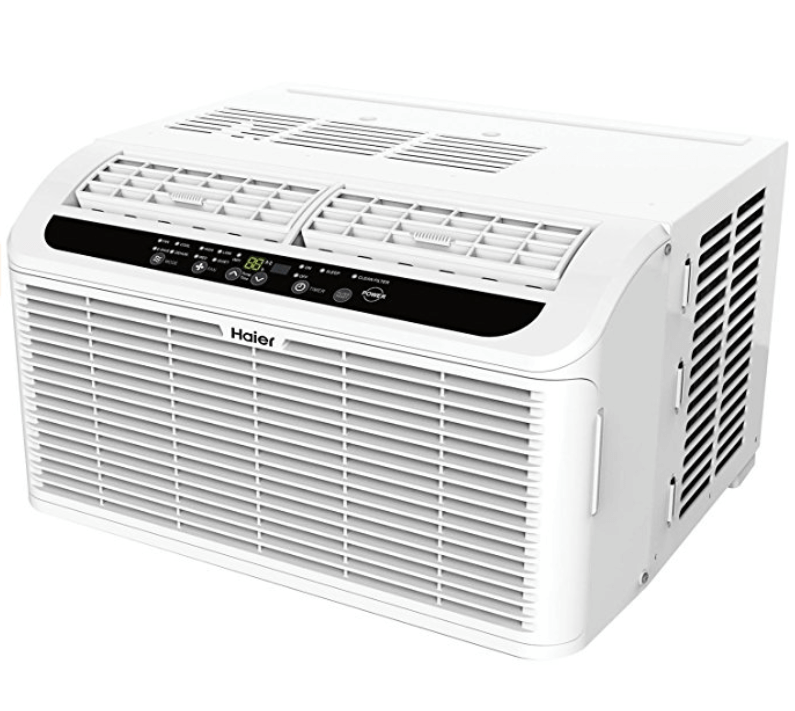 If you are facing spatial restraints or you are simply not willing to drop too much money on a standard air conditioner, a unit of this type is a great long-term investment. Make sure to read through our picks, and you will surely find a model that is to your liking.